On March 6, when entering the Tibet Room of the Great Hall of the People, reporters see a large acrylic mural painting titled “Tashi Delek: the Happy Tibetan New Year”, which is 18 meters long and 4.5 meters tall. It is understood that the mural painting was completed in the early 1980s. 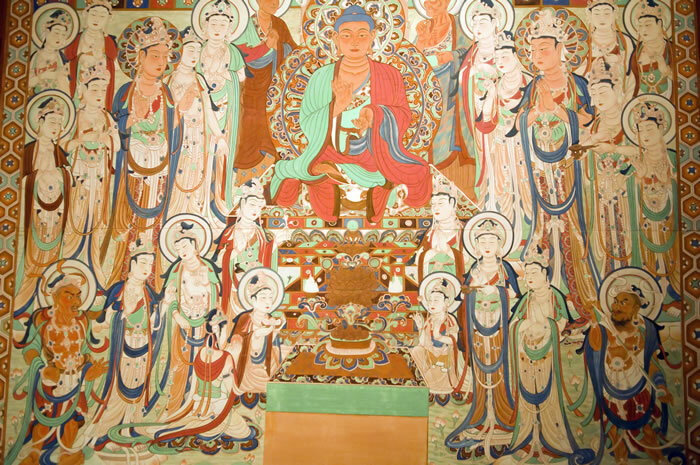 The design and creation for this mural contains the wishes and blessings of the 10th Panchen Lama Erdeni Choskyi Gyaltsen, who reviewed the painting and visited the site many times to guide the creation and production of the mural. 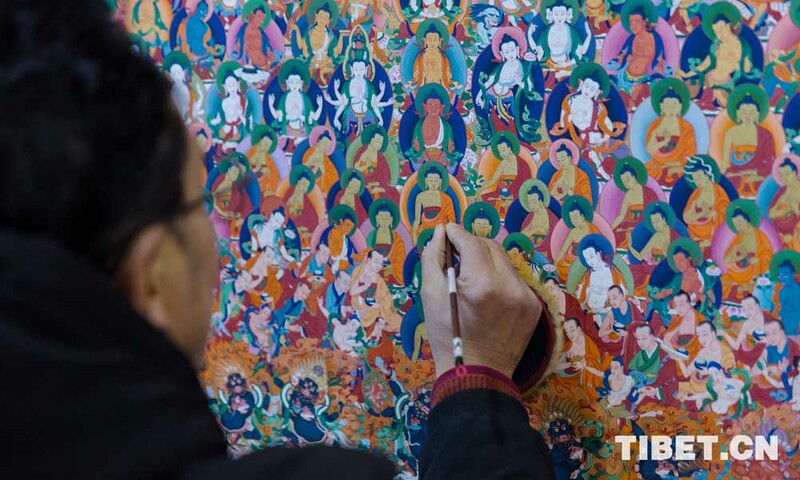 The “Tashi Delek” mural painting combines traditional Tibetan painting with realism, and it is rich with ethnic characteristics and the spirit of the times. 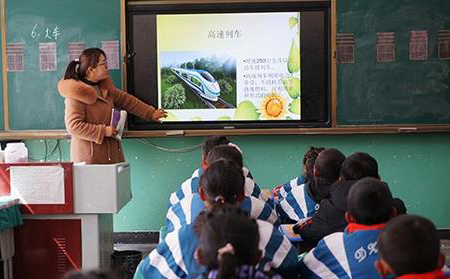 It shows people of different ethnic groups in Tibet who were emancipated are celebrating their Tibetan New Year. According to the master painter of the mural painting, the 10th Panchen Lama repeatedly stressed that the mural should highlight the Tibetan-Han stone tablet and the willow planted by Princess Wencheng of the Tang Dynasty in front of Jokhang Temple to show the long history of Tibetan-Han relations and exchange of the two cultures. 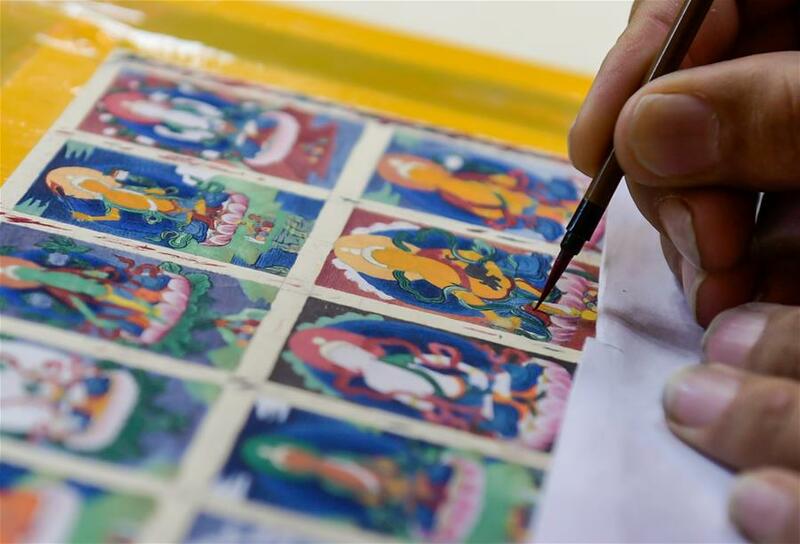 The Panchen Lama also made some specific instructions such as to change the flying birds into doves symbolizing peace. 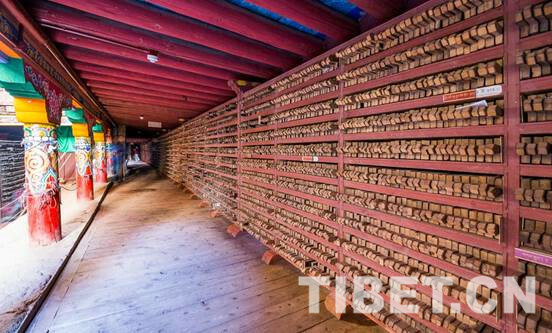 In the center of the “Tashi Delek” mural painting, there are the auspicious patterns such as sheep’s head and barley crops that are surrounded by Tibetan men and women doing a circle dance. On the left side of the mural painting is a Tibetan nomad woman holding a torch waving goodbye to the old year. She is surrounded by scenes of eating, bathing, carrying water, firing a gun, throwing grain, playing a dramnyen and dancing. There are also ethnic Monba and Lhoba people holding fruit. On the right side of the mural painting is an elderly farmer who sings to welcome the new year. 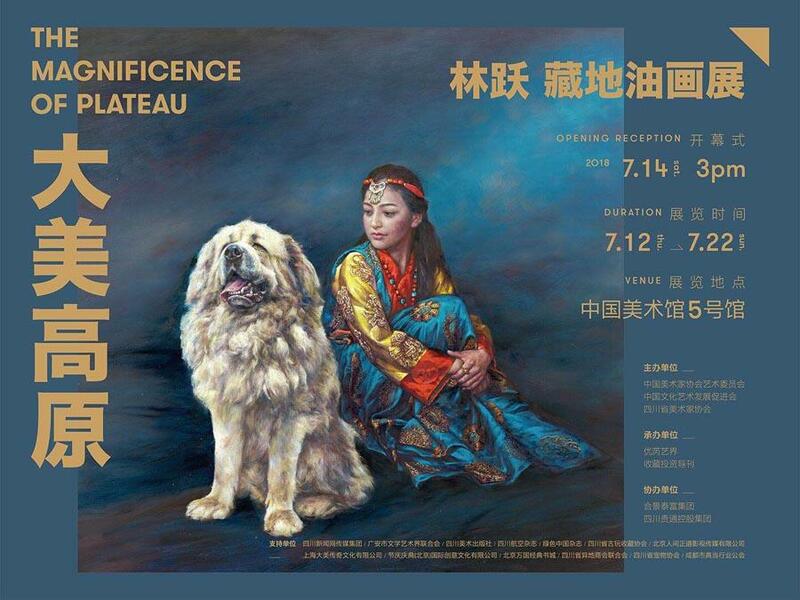 He is surrounded by folk customs such as New Year’s greetings, offering khata, horse racing, dancing Tibetan opera, chhang songs, tug-of-war, and ploughing scenes. 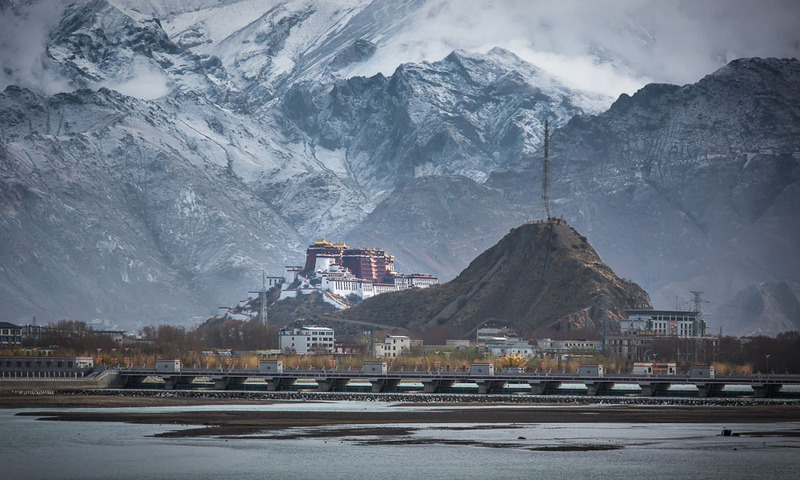 The background features the Potala Palace, snow mountains and rivers. 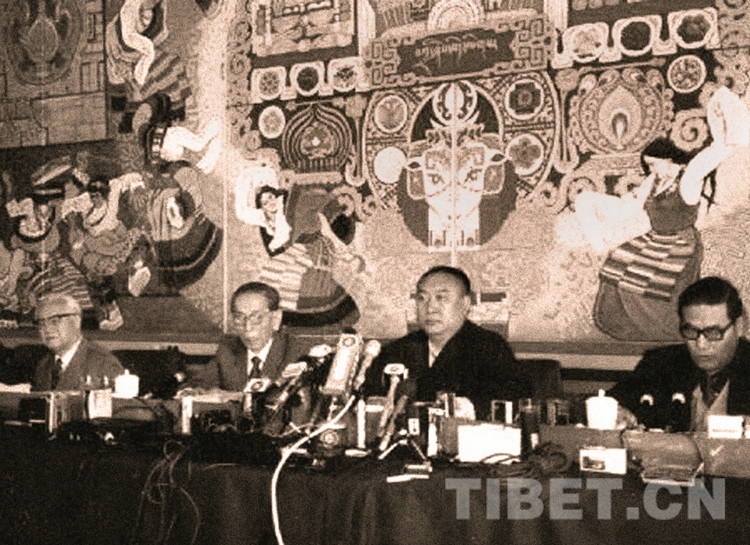 The 10th Panchen Lama (third from left) sits in front of the mural painting “Tashi Delek” in the Tibet Room in the Great Hall of the People. The mural painting “Tashi Delek”.